The Scene We've all been there. You're up late, working on that post for that game that you really should have posted in a week ago, but at least you're getting it done now! Go you! It may have taken an hour to get your over-worked, over-stressed, sleep-deprived brain to put together enough coherent words to make a decent post, but you're almost done. Just one more thing... and then it happens. Your browser crashes. You accidentally close the tab. You hit the back button. That weird backspace thing happens that only seems to happen when it shouldn't happen. Whatever the reason, you've lost your post, your monitor has a hole the size of your fist in it, you're on the way to the hospital to get your broken hand fixed, and what's worse is you've lost the motivation to post. Let's face it, you've become an incompetent gray-scale infomercial person. Well no more! After reading this thread, you will no longer be stuck in the life of the monochrome failures. You'll see the world in a new light, the light of color! You'll be up-to-date on your games, practically worshipped as one of those fabled Dependable Persons! Your bank account will swell, your garden will bloom, and you'll finally be able to work up the courage to speak to that special someone! Or, you won't lose your posts anymore. Either way, it's a win-win! What's that? Why yes, I did write this at 4 in the morning. What's that got to do with anything? Anyway, back to the topic at hand. Follow these easy steps to ensure you never again be a statistic. Someone is probably counting. The Clipboard: It's simple. Get in the habit of highlighting your post often(ctrl-a) and copying it to the clipboard(ctrl-c). I do it every time right before I click 'Go Advanced' or 'Preview Post'. It won't save you from a power outage, but should work almost every other time. Notepad: Compose your post in a text editor. Get in the habit of saving(ctrl-s) often. How often? That depends, how much work are you willing to lose? A Laserdisk: Stored in your safety deposit box. Now we're talking physical, off-site backup. Go commitment! One of those really fancy disks they sent up with the Tesla Roadster a couple weeks ago: I didn't realize you were a fan of tabletop games, Mr. Musk! Pen and Paper: Now you're just being silly. Also, writing makes my hand hurt. Get a browser extension. That's it. Seriously. I just closed this tab for funsies(ctrl-w), then opened it back up(ctrl-shift-t), then hit the back button, then the forward button, then submit. Pretty neato! Even if, for some reason, your work didn't automagically just appear in the box, then still have no fear! 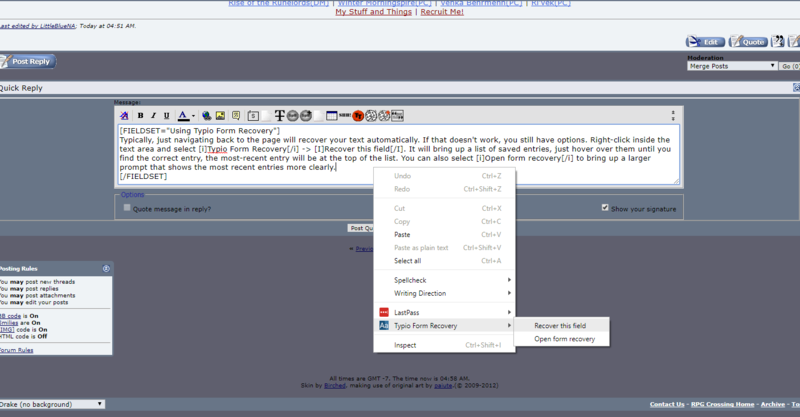 Just right-click, select the Typio Form Recovery(or Lazarus equivalent) option and presto restoro! Internet Explorer: I'm sorry, there's no hope for you. Safari: Well look at you with your fancy iComputer. Seriously, I have no idea how those things work. Last edited by LittleBlueNA; 02-25-2018 at 11:08 PM. Typically, just navigating back to the page will recover your text automatically. If that doesn't work, you still have options. 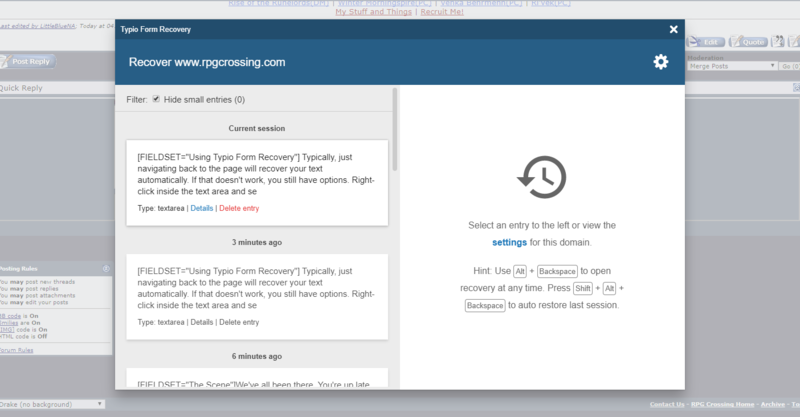 Right-click inside the text area and select Typio Form Recovery -> Recover this field. It will bring up a list of saved entries, just hover over them until you find the correct entry, the most-recent entry will be at the top of the list. 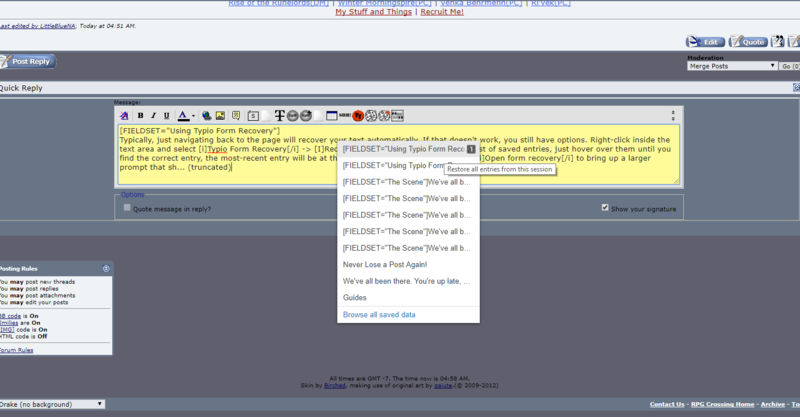 You can also select Open form recovery to bring up a larger prompt that shows the most recent entries more clearly. By default, Typio Form Recovery saves entries for 7 days. You can delete them manually in the Open form recovery prompt, or probably some other way. There are options, play around with them. Or don't.